Random Observation/Comment #77: The title of the entry may sound confusing, but it was just a random comment because we saw someone that looked like Clark Kent while walking around Kiyomizudera. It was the smallest comment with the shortest joke lifespan possible, but I still remembered it so well. I remembered it well because I remember every little thing from this day as if I had written all the details the second after they happened. In the past 2 months of living in Osaka, Kyoto was one of my favorite weekend visits. It was only 40 minutes away on the Hankyu line, and there were enough shrines and temples to keep me entertained for a whole week of consistent tourism. 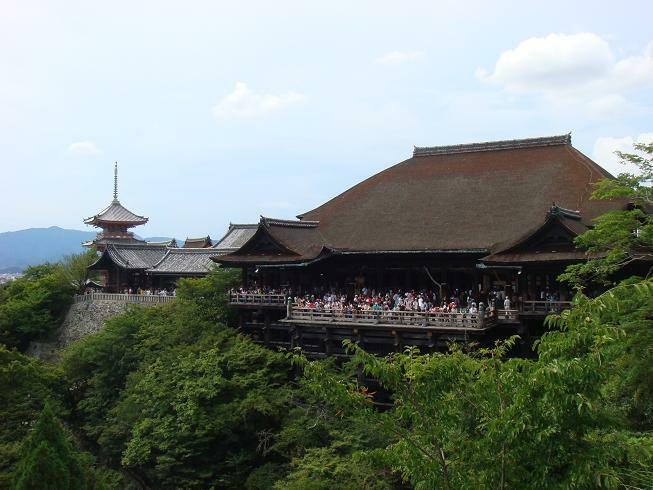 I hesitated visiting the well-known tourist areas, but the place that I wound up visiting twice (Kiyomizudera) was actually well worth the second visit. The first visit made the city below look mysterious like a foggy Silent Hill, haunted with murderers and paranormal investigations. This time, though, the atmosphere was much less ominous and much more welcoming. There were other people I knew there to help me take pictures and perform those tourist activities, like walking the love stone path (I made it! Love should come soon (. . )>). After the temple meditation, we continued exploring the North-West area of Kyoto near Kinkakuji (Golden Pavilion). There, we found a very famous rock garden filled with 15 large stones, only noticed by the enlightened (well I guess I just couldn’t see it from where I was standing). The garden doesn’t really have a concrete documentation of the original meaning, but many have hypothesized that it represents a map of Japan. In case you’re not familiar with rock gardens, it’s exactly what you would expect from the given name. Little gray pebbles of approximately the same size are carefully groomed by a rake to create perfect ruffles. The patterns look like little waves which circle around the larger rocks embedded in their artistically placed locations. The turtle rock garden near Ginkakuji (the Silver Pavilion) was much less crowded and a little bit more beautiful, in my opinion. At the end of the day – no matter the sight – it was nice to just sit down and poke Yuka’s brain about Japanese history and use this opportunity to take advantage of this knowledge at her (and my) fingertips. Due to the popularity of these major tourist attractions, there was barely any room to breathe, let alone take pictures without 20 tourists sneaking into the frame. Although my frustration levels were a little higher than usual, I still stayed patient to do my routine poses and weird angle shots with the temple behind me. 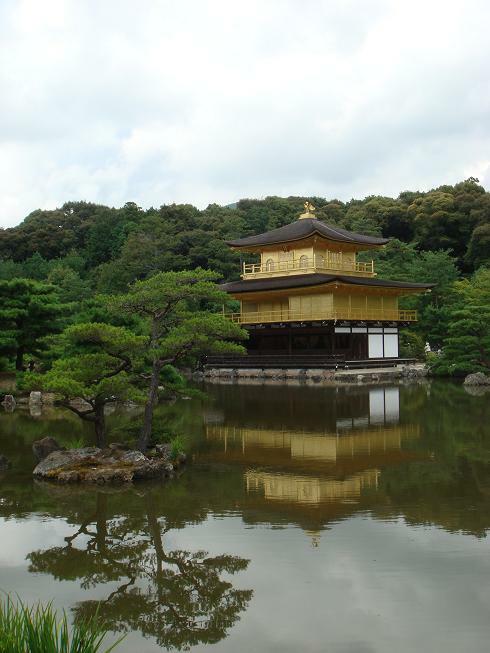 The Golden Pavilion looked mythical from across the pond. Its reflection in the undisturbed water enhanced the overall glow of the structure. I think a major contribution to this glow might be that layer of gold completely covering the windows, doors, and balconies. The view was so nice that I would rather be one of the lords living right outside than the person living inside. I guess it would be pretty cool to be surrounded in gold. If that’s not the definition of royalty, I don’t know what is. From Kinkakuji, we took the bus to Kiyomizudera and walked around the main area. It was the same temple, but a new experience with the additional friendly conversation and history lessons. This temple is usually crowded (since it is one of the most commented temples in all guidebooks), but today it was exceptionally crowded because of the special praying rules of the week. Apparently, there is a window of opportunity to pray and make wishes in this particular temple that count for 1000 wishes or 1000 visits (it might be 100, I’m not too sure). Basically, if you’re willing to wait on queue to pray on this day, you’re set for the next year. It seems that this temple is famous for the crazy looking chubby guy that looks like the boss from Kirby’s Dream Land (Yes, he even has a hammer). This is the god of business prosperity, so treat him with respect (he likes candy and the souls of investment bankers). When the customs and meanings of each of the temple’s little statues and activities were explained, the significance of the temple became much clearer. The first visit left the impression of a simple beauty in scenery. Now, I see this place spawns hope in so many hidden decorations. An architectural amazement – The entire temple does not use a single nail to maintain structural static equilibrium (that’s my nerdy side talking). A spiritual pool – Each god follows a cleansing of spirit that will help you dissolve your fears, repel your bad luck, and bring fortune to your future. An artist’s dream – every detail is carefully etched and molded bringing their wildest imaginations behind your eyelids. This temple offers another step towards Zen. I wonder how much it would cost to reserve the entire place for a wedding proposal (I guess there will always be a side of my brain that thinks like a hopeless romantic).